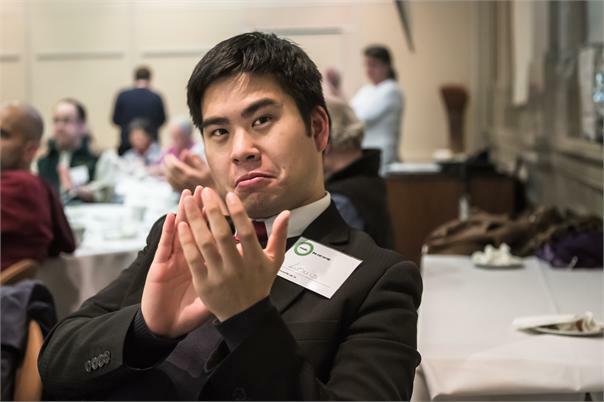 The 2013 Annual General Meeting of Modo The Car Co-op was held on Thursday, January 24, 2013, at the Segal Graduate School of Business, 500 Granville Street in Vancouver, BC, Canada. 86 shareholding members and 15 non-shareholding members and guests attended - the largest turnout yet! At the AGM, the board of directors and executive director reviewed the previous fiscal year's operations, financial results and achievements. Find executive director Phil Baudin's tidy overview below. Out of five candidates running for the board, shareholding members elected three directors: Gregory Freeman (re-elected after his previous 1-year term expired this year), David Lach (a previous director who’d taken the last year off from board duties) and Amy Severson (a fresh face to the Modo board). Read their Candidate Statements on our blog. We thank outgoing directors Maureen Collier and Yasuhiko Ogushi for their outstanding service. After the AGM, members and guests gathered across the street at the Modo office for a fun-filled after-party, with music and mood lighting by Modo member willisist of SHAHdjs, food by Good Girl Bad Girl Preserves, a Sweet Sixteen birthday cake from Edible Flours, drinks, a photo booth, prize giveaways (including tickets to the Vancouver Canadians and 'King Lear' at the PuSh International Performing Arts Festival, organic teas from Turtle Island Teas, a Modo cycling shirt and a Greenster coupon book!) and an opportunity to meet other members. Big thanks to Modo members Willard Lombard, Vickie Turvey and Bradley Cuzen for volunteering your time, creative energy and skills! Thanks, too, to photographers Kris Krüg and Rufio van Hoover for helping us share the Modo story through their wonderful photography. 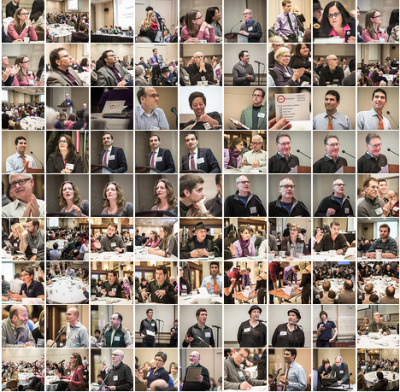 Click through for 130 memorable moments from the AGM, captured by photographer Kris Krüg (aka “kk”). what does modo mean to me? 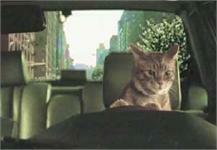 modo on cbc: "our real competition is the personal automobile..."
what else can modo share? This has been another exciting year for Modo The Car Co-op. Our highly successful rebrand continues to increase our visibility and appeal, and this year we improved our profitability such that we now have a surplus in retained earnings. We eliminated trip logs from every vehicle and added fuel cards to simplify the driving experience. Further expansion of our fleet and service range. On behalf of everyone at Modo, I would like to thank you, our members, for the support you continue to demonstrate for Modo by using our services and sharing your vision for more sustainable transportation in our region. Share the good news with friends using the link to our blog! 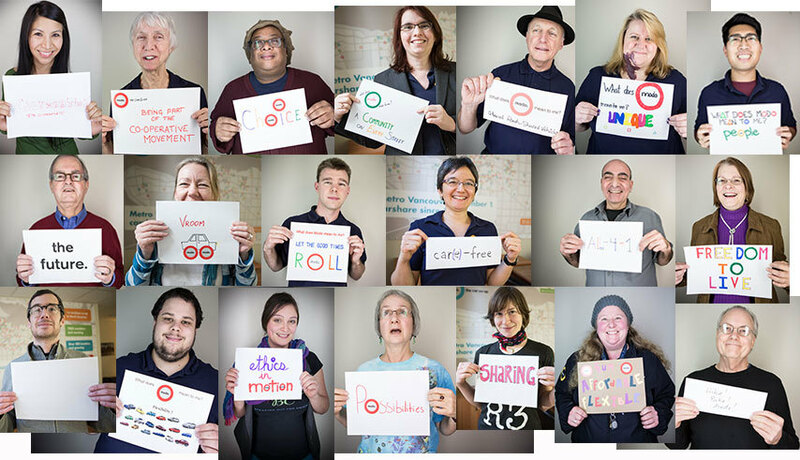 We asked members and staff to tell us what Modo means to them in their lives. For some, Modo is defined by the vehicles we share; for others, Modo is more than cars - a culture, a philosophy, a symbol. See the full photo gallery on Flickr! 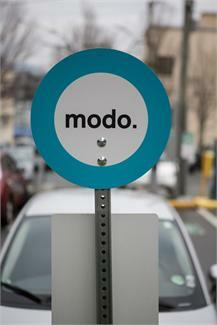 Make a sign answering the question, What does Modo mean to me? Send it to marketing@modo.coop and indicate that Modo has your permission to post the image through social media and the website. In your inbox, you'll soon find a link to our brief annual survey. (Or click through to find it here.) Please help us to improve how we serve your needs as we grow by taking 10-15 minutes from your busy day. Many thanks for sharing about your experience! ... "Hey! What about the cat?!" 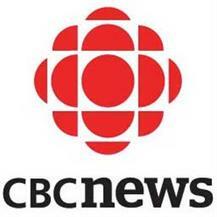 After the news of Avis-Budget's $500 million buyout of ZipCar, CBC Radio and CBC News were quick to contact Modo for our take on carsharing and how the big multi-national carshares are impacting business for our locally owned co-operative. “The fact that there are multiple carsharing organizations in this city is fantastic," Modo board chair Joel DeYoung told CBC. "We see our real competition is the personal automobile." Car sharing is big business in Vancouver via CBC NEWS VANCOUVER AT 6, Jan 2, 2013 (2:09) - Rental company Avis put up 500 million dollars to buy Zipcar and enter the market. The Boom in Carsharing via CBC RADIO BRITISH COLUMBIA'S BC ALMANAC, Jan 3, 2013 (05:00) - Joel deYoung, Chair of the Board of Modo. The Car Coop on the steady growth of car-sharing in British Columbia. Information systems director Karen New adds, "Although most of our stalls are reserved for a specific car, we do have two designated Modo stalls which any Modo car can park in: at Ikea in Coquitlam, right next to the entrance." We often hear from members that not only do they want to share vehicles but rides, too. So, back in November, we asked you for your ideas on how we might expand and grow sharing among our membership. Click through to read some of the well-thought out responses we’ve received, as well as staff responses as to the viability of members' ideas. And keep ‘em coming! Email info@modo.coop with the subject “Sharing” to share your ideas on sharing rides (or boats or cargo bikes or vacation homes or…). Thanks! Modo is proud to sponsor another year of PuSh, which features stunningly conceived, eclectic performances by international and local performing artists. Now in its ninth year, PuSh engages and enriches audiences with adventurous contemporary works in a spirit of innovation and dialogue. Download the app and take in the last of the festival's shows this weekend. Release your wheely creativity at our very first bike art night, through bicycle zine making, bike journalism, bike film, bike crafts and bike choir - as well as the usual bike repair drop-in services. To be followed by a social/fun ping-pong tournament and maybe a movie. (Bring snacks and art supplies to share!) Kickstand is a community bike space for repair, workshops and more, offering free used/recycled bike parts. "The only type of currency we accept is enthusiasm!" Details. An evening of food, fun and a photography and multimedia slideshow featuring local and international artists. Started in New York, SLIDELUCK is a non-profit arts organization that provides a forum for artists, curators, reps and editors as well as a community gathering place to appreciate food and art in a casual, inclusive atmosphere. The evening begins with a bountiful potluck dinner and then a spectacular slideshow showcasing the work of local and international artists. Buy tickets and read potluck rules. Learn what makes your wheels turn and pedals spin through HUB's course on bearing systems and how to overhaul them. Bicycle bearing systems should be overhauled at least once a year, and this is essential knowledge for the cyclist who wants to learn how to replace and repack and adjust bearing systems. Register. Modo is proud to be a venue sponsor of the newly formed Trade School Vancouver, a non-traditional learning community based on barter. This workshop goes beyond the basics of what it takes to make a glass of milk, from the Grass to the Glass and explores the components of milk, the ways in which milk is used, Organic vs Conventional milk, and the future of Milk in our lifetime. Taught by Dr. Lethan Dwan, a veterinarian working predominantly on dairy farms that produce milk for the whole milk market in BC. Register and find more Trade School Vancouver classes. LOCO BC events are hosted by members in factories, stores and warehouses, with good local food, drink and business connections with the city's most innovative entrepreneurs. Get to know other members, strengthen community and leverage the LOCO network to support a stronger local economy. The February event takes place at the Axis Insurance Managers office. Register. Vancity members are invited to one of two free presentation by best selling author Robert Gignac, talking about his book Rich is a State of Mind. Gignac will discuss the parallels between personal and financial development, and how concerns over personal finance can directly effect our lives and our relationships with the people around us. With an entertaining yet direct speaking style, Robert offers a lighthearted look at financial planning with a serious message of personal responsibility. To reserve a spot, visit any Vancity community branch. Join UBCC350 for a night of speakers including community activists, UBC students and UBC faculty, including Emma Avery (UBC student), Prof. Kathryn Harrison, Prof. George Hoberg, Jamie Biggar of Leadnow.ca and Matt Murray (UBC student). Sponsored by UBCC350. Details. Celebrate Valentines Day with delicious treats, creative cocktails, saucy games and a Naughty or Nice photobooth. Join Zoe and Karen for a night of tasting, games and prizes as they launch their latest preserves. Tickets and menu. In celebration of International Development Week, the BC Council for International Cooperation in partnership with Gen Why Media invite BC youth (ages 29 and under) to an exciting afternoon of networking, sharing and inspiring each other. Featuring guest speaker Jessica Fraser (Co-Creator of Mobile Movement), interactive panel featuring youth recognized for collaboration on global causes, roundtable discussions on taking action on global issues, facilitated by international development students, prizes and refreshments. RSVP. Travel to China and back in an evening through William Jans’s engrossing, off-the-wall live travelogue show, with photos, video, costume and compelling stories. In this sixth instalment in William’s travelling series, the gonzo photographer finds adventure and hijinks in the Philippines and China - sleeping on the Great Wall (“illegal but very cool”), treacherous mountain hikes, the Crucifixion Festival north of Manila, volcano climbs, and more weird and wonderful stories. Previous shows have featured William’s adventures in Tanzania, Tibet, South America, Burma and Burning Man. See Off The Wall In China on February 8 in Surrey and February 21 in Vancouver. Details and tickets. Head out to New West for some great family fun and entertainment, including live animals (parrots, frogs, lizards, snakes, turtles and more), ExploreGreen (an environmental educational arts and crafts program), Youth Lounge (video games, table top games and more, for ages 11+), New Westminster Museum & Archives programs & artifacts, guided tours on Samson V, outdoor sports for all ages on the boardwalk (weather permitting), youth musicians, a magician show, CoCo the Clown and children’s meal specials at RiverMarket food vendors. The first 50 families will receive gift certificates for local services and products. Presented by City of New Westminster's Family Court Committee and organized in partnership with Fraser River Discovery Centre, School District #40 and River Market. Details. An exciting evening with playwright Jordan Hall reading excerpts from her award-winning environmental play, Kayak, and facilitating a discussion about the intersections of environmentally-themed writing, and strategies for developing, writing and thinking about staging public performances and interventions. Participants are invited to bring performance ideas or concepts at any stage of development to the Salon for workshopping after the reading and discussion. Refreshments provided, but please bring your own mug. Details about the event and the artist. Spend a day working on your calling, connect to other changemaking local business owners, and take the time away that you rarely give yourself to focus on strategy rather than fighting fires. ubizo (oo-bee-zoh) is a day-long workshop, now in it's third year. It's a business development think-tank designed for locally owned, values-based business owners and leading-edge social entrepreneurs. This one-of-a-kind event brings entrepreneurs, mentors and peers together to discuss common business challenges and to create new strategies for business growth and success. Register. We have a new location at Villa Cardello. Find vehicle #262, a 2009 grey Nissan Versa sedan, behind 1580 Haro Street at the corner of Cardero Street. A 2012 red Nissan Versa hatch (#429) has replaced the 2005 white Toyota Echo. A 2012 blue Toyota Prius C (#426) has replaced the 2007 black Toyota Yaris hatch. A 2012 red Nissan Versa hatch (#431) has replaced the 2004 white Toyota Echo. A 2012 green Mazda 2 hatch (#425) has replaced the 2008 orange Suzuki SX4. Vehicles #413, an orange Toyota Prius C, and #419, a silver Toyota Prius Plug-in, will live here until their permanent homes are ready. Located behind 687 East 27th Avenue at the corner of Fraser Street, find a 2008 black Toyota Yaris hatch (#268). A 2011 red Nissan Versa hatch (#428) has replaced the 2007 black Hyundai Sonata. TRUCK SWAPS: Next week, in an effort to distribute cargo vehicles more equitably, we are shuffling several of our trucks around. Currently, we have four on the downtown peninsula (three trucks and one cargo van), but only one west of Oak Street. Once the swaps are complete, we will have two trucks and one cargo van in downtown and two trucks on the west side. W 8th & Bayswater may be empty for a week or two, while we buy a new car. St. Augustine's will now have a red 2004 Ford Ranger (#241). Highbury will now have a white 2007 Mazda B3000 (#171). You’ve received this newsletter because you’re a friend of Modo The Car Co-op. Want to send feedback about our newsletter? Email us at newsletter@modo.coop. Have a specific question regarding Modo's vehicles or service? Email info@modo.coop.